Fan-favorite and MTI powered race boats, Wake Effects and FB Marine Group, are preparing to bring home the checkered flag this weekend at 2018 Thunder on Cocoa Beach! Check out the race-day schedule, below, to find out when you can support your favorite MTI team! 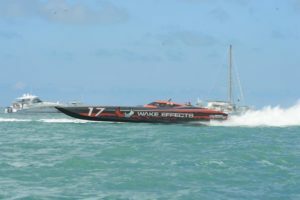 With race weekend starting Friday, May 18 and race day on Sunday, May 20, Wake Effects and FB Marine Group are readying their MTI offshore race boats to cross the finish line! Fan-favorite, Rusty Rahm, owner and driver of the 48-foot Wake Effects MTI, will be joined in the cockpit by Jeff Harris. Always a crowd pleaser, FB Marine Group’s 40-foot MTI offshore race boat will be driven by team owner, Randy Sweers and returning driver Glenn Hibbard. Check out the race-day schedule, below, for when you can catch your favorite team take the checkered flag! 8:00 am – 9:00 pm Press Credentials – Race Village – Flounder Dr.
For more information on race times and where to purchase tickets, click here.